As promised, I’ve got some more thoughts and stats about Day 3. Between a lack of internet and sheer exhaustion, I’ve gotten behind on this blog. Luckily, I took trip notes. Left Springfield and made it to Oklahoma within the first hour or so. 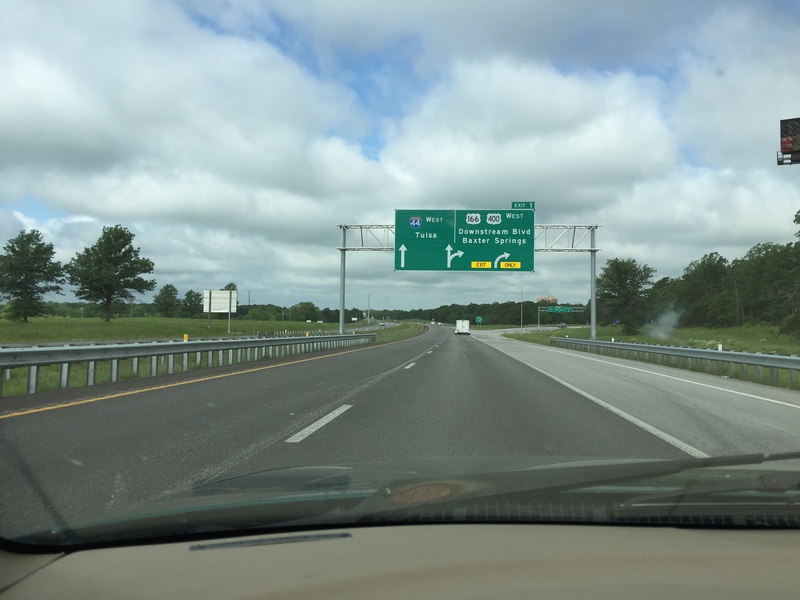 I was immediately surprised by the speed limits on many of the state routes and highways. I don’t believe I’ve ever driven on roads were the posted speed limit was 75 mph. (I have, however, driven I-85/I-285 in Atlanta hundreds of times, and while the understood speed limit was at least 75, it wasn’t, exactly, legal.) My mileage was definitely affected by going this quickly, but it was completely worth it. As I mentioned before, Oklahoma looked nothing like I expected. I think we get this impression growing up on the coasts that the “middle” of the country is just open, brown, and boring. Oklahoma was anything but boring. Rolling hills out of the Ozarks morphed to wide open spaces full of trees. I only really got to the prairies I was expecting toward western OK going into Texas. Tulsa was kind of a weird city to drive through. Both kind of cooly modern while simultaneously weirdly dappled with casinos. 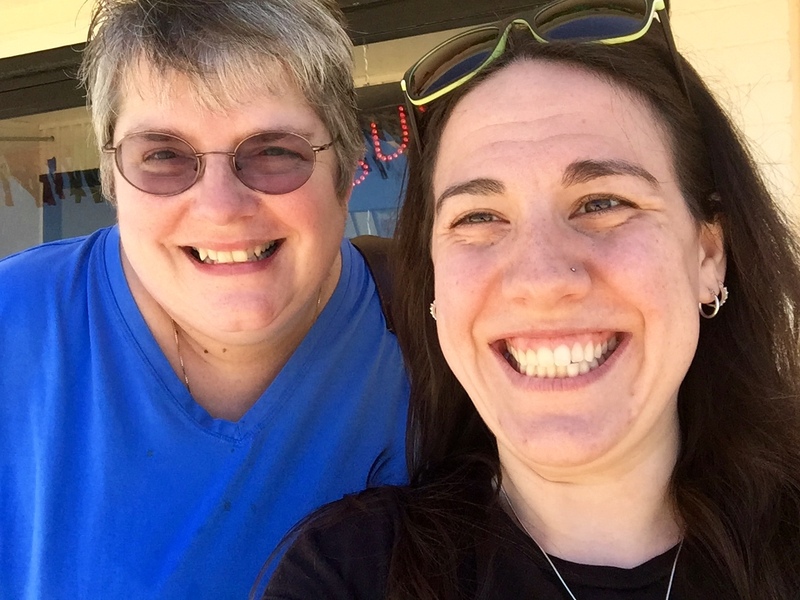 Stopped in Shawnee, OK to have lunch with my awesome Aunt T. She’s my aunt in the sense that she is my mom’s oldest friend/maid of honor. While the trip that day wasn’t particularly long mileage-wise, it was nice to have the break in the middle to catch up (I hadn’t seen Aunt T. since high school) and have some Pho at the brand-new Shawnee Pho (I’d link to it, but that’s how new it is). Got that selfie in for Mom (how adorable are we?) before hitting the road again for Amarillo. Leaving Shawnee began the long trek across I-40/Route 66. Once I passed Oklahoma City, the road completely opened up and it began to get flatter. 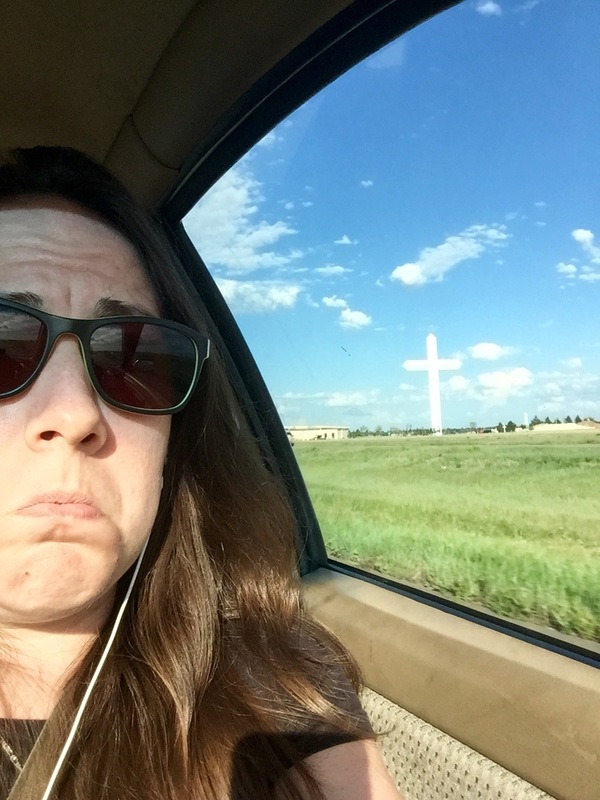 The cross into Texas was exactly what I expected. Lots of oil fields and refineries. The largest free-standing cross in the Americas (complete with matching late 90s style website!). The prairie got more scrubby and desert-like as I went. Absolutely stunning. Got to Amarillo right before sunset for my second night of Couchsurfing. While I still completely recommend it, I was a little wiped by the time I got there. I get unusually (for me) introverted when I get tired/stressed, so as lovely as Angela and her family were, I found myself struggling to be sociable. Luckily, she and her kids seemed to get it and let me sit there watching Full House and Fresh Prince with them without expecting all that much interaction with me. Went to sleep relatively early, as Angela needed me to get out of the house by about 6 a.m. (kids had to go to school), which gave me the opportunity to get going on my longest leg of the trip pretty early. At this point in the trip, I’m at 1514 miles, so over halfway. Definitely going to need an oil change once I get to California. More posts coming up in the next few days. Don’t want to rush this. Luckily, all of the tech I used on this trip (and the actual handwritten notes I took) are allowing me to reconstruct this pretty well. MPG Day 2: Tank 1: 27.23 mpg. Tank 2: 27.11 MPG. 75 MPH highways had a lot to do with this. Day two was pretty amazing. I’m currently importing all of the photos from the GoPro, and I can’t wait to see this timelapse (This might be delayed, y’all. It’s really big). Kentucky continued along with rolling hills until Illinois (which I was in for all of about 10 miles). Torrential downpours from the end of KY through the beginning of MO made the trip a little gross, but when the sky cleared up. So you know how you know something will happen but you don’t know it because you just didn’t think about it? Yeah, totally had that moment crossing the Mississippi. To be fair, it was pouring and I’d just crossed several other rivers. But there was definitely a “oh hey, look at that!” moment. Crossed into Central time at some point. Have no idea where. Missouri was beautiful. A little flatter than I expected at first, but then I entered the Ozarks. Best part of the Ozarks: passing all of the Laura Ingalls Wilder stuff while simultaneously passing Amish buggies on US-60. For a hot second, it felt like being in an episode of Little House on the Prairie. With cars. Stopped in Poplar Bluff, MO at a Harps grocery store for a homemade hoagie. Totally worth the stop. Am starting to think I’ll stop at grocery stores instead of fast food joints from now on (except Taco Bell. Please.). Made it into Springfield in early evening and met up with my Couchsurfer hosts Melanie and Holly. If you’re looking to do this same cross-country route, I highly recommend them as hosts. Holly and Melanie, their two dogs, and one super fluffy cat made me feel quite at home. 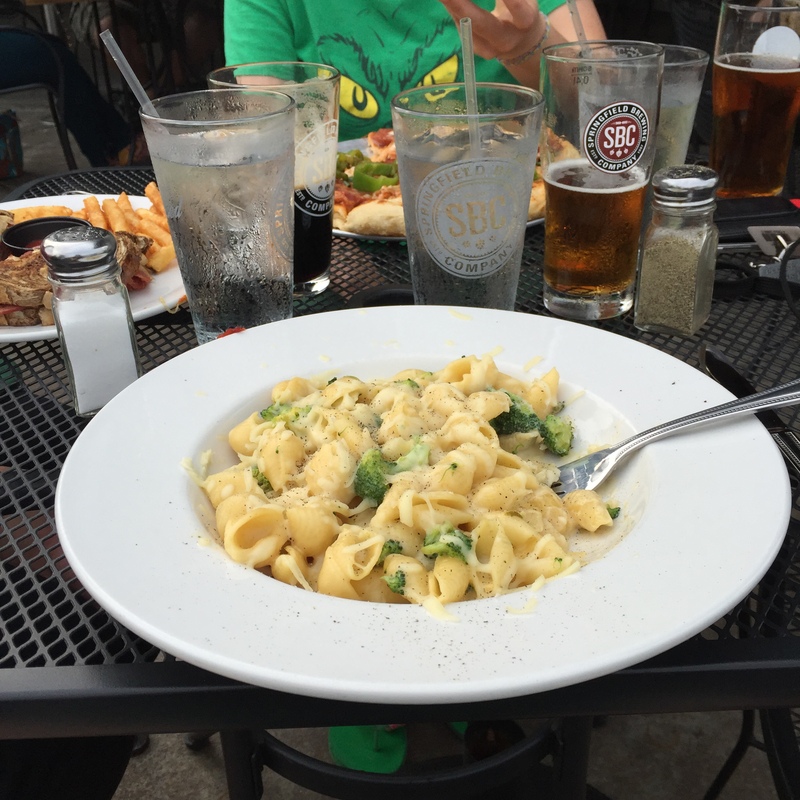 Beer Mac and Cheese. OM NOM. After arriving, they took me to downtown Springfield, which has a wicked cool college town vibe. After dinner at the Springfield Brewing Company, we popped over to this amazing townie bar, the Patton Alley Pub, which was having a tap takeover by Mother’s Brewing Company, a local brewery out of Springfield (beers I tried: McJagger Irish Red, Ruby). Another friend of theirs, Devin, joined us, and we had a fantastic time. At the end of the night, we returned to their place to marathon HIMYM and have a few more beers. Congrats, Melanie and Holly, you have set the CS bar way too high. I look forward to seeing if my next couple stops can compete! Today I head to Amarillo, TX by way of Shawnee, OK (where I will be having lunch with my awesome Aunt!). Leave me some love! MPG Day 2: 25.65 for first tank. Not sure what the second one is. Given I was averaging in the 30s before I left, I’m going to blame weight and the untested cruise. Other suggestions would be welcome. This is making me angry. The first part of my trip was relatively short and pleasant. I met my college best friend (and “big sis”) in Lexington, KY along with her family before a quick jaunt to Best Buy (I’ll explain) on the way to Fort Knox, KY. The trip started pretty frustratingly. My plan to use the GoPro for the trip was (nearly) foiled by a firmware update. Went to update the Hero3+ Silver for the first time in (probably) months, and for some reason, it wouldn’t turn back on after the install. Several bad words later, I left for breakfast with the brother, the brother’s roommate, and the brother’s roommate’s dad. After a brief respite from the camera stress, we went back, hoping that it had magically fixed itself. Angry, I made my last stop on the way out of town, gassed up at the University City Kroger, and headed out. Not going to lie, I was super bummed about the GoPro. 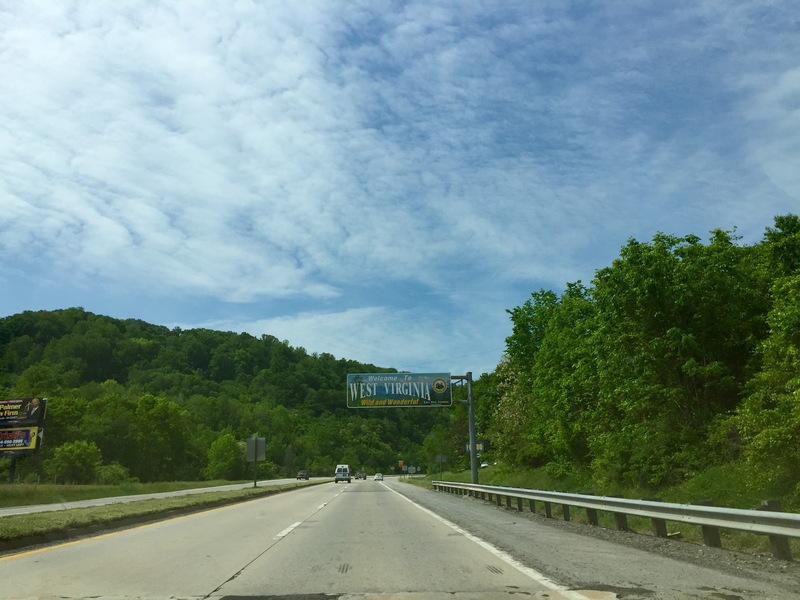 If you’ve never done it, the drive up US-460 West to I-77 North/I-64 West through Charleston and Huntington, WV is some of the most beautiful driving on the East Coast. I’ve done the trip a few times (though never past Charleston prior), but never in bright, green spring. 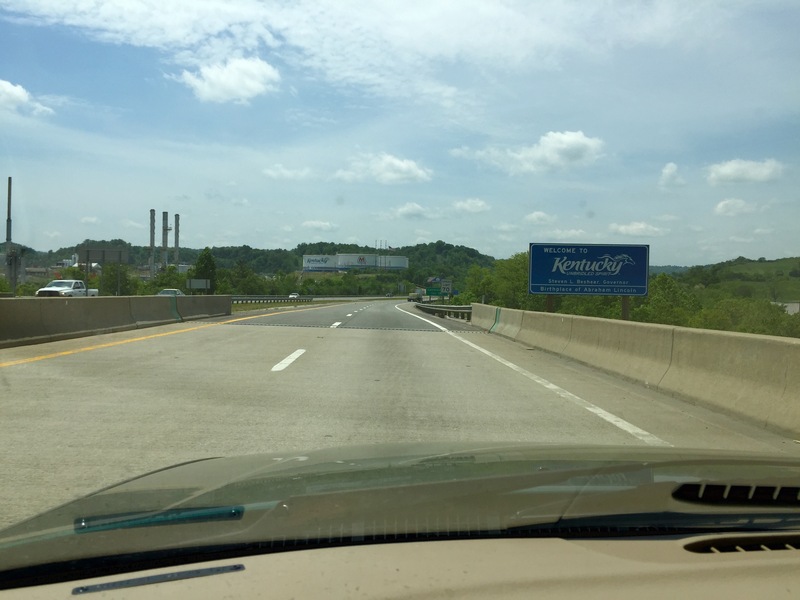 Nearly every time I drive through West Virginia, some well-intentioned person always warns me about being “safe.” “Hillbilly” prejudice drives me nuts, especially given I was raised in WV for many years (and I’m related to half of Keyser, WV…). It’s a bias that just grates on me. Not having the video of the trip to show people just how lovely one of my homes is is going to be one of my biggest regrets of the trip. Yesterday was my first time in Kentucky. Fun fact: the grass is not blue. It’s not. At all. I feel lied to. Once I crossed the WV/KY border, the mountains died down, and I was driving through gorgeous piedmont. I don’t know why I assumed KY would be more mountainous. Probably because elementary school geography was over twenty years ago… (my G-d). The drive was stunning. I cannot wait to see more states I haven’t seen before! Plus, the roads seriously opened up the second I entered KY. If this is any indication about how driving is going to be in “the middle part of the US,” I’m really looking forward to the pace. Made it to Lexington with relatively few problems (springtime roadwork is going to destroy me on this trip, I think). 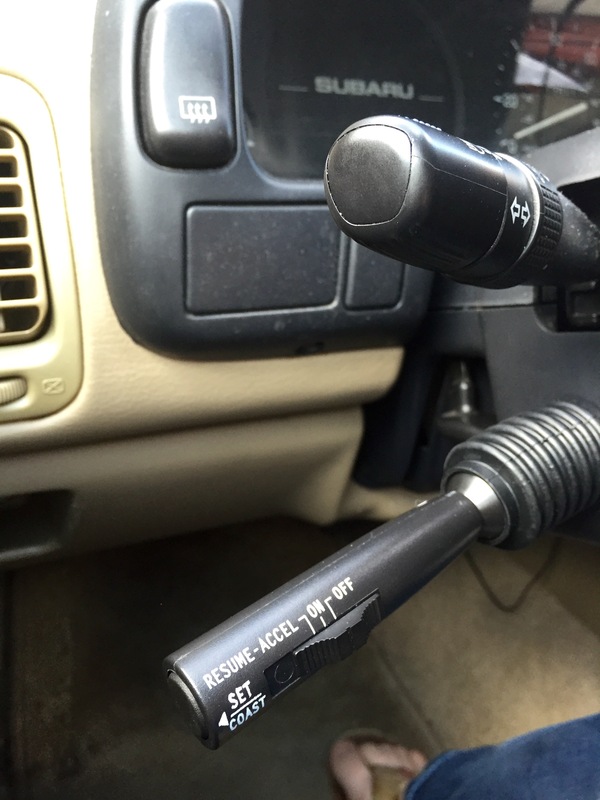 The cruise control has kind of a weird relationship with my throttle, but I’m getting used to it. Ate at the Cracker Barrel in Lexington (I seriously hadn’t eaten there since college. It did not disappoint.) before swinging by Best Buy. My awesome partner ordered me a new camera for the trip (we’re not 100% if the other one is fixable. It’s being sent off), so we did manage to get video from Lexington to Fort Knox. This was set to take photos every 5 seconds. Let me know if you have any suggestions on changing that. Today is a chill day in KY with J. Watching The Fast and the Furious 1-4 (relationships make you do funny things…) and staying in on a truly miserable rainy day. Tomorrow I leave at the crack of dawn to drive to Springfield, MO. Looking to Couchsurf across the country (Yes, it’s safe. No, don’t yell at me). Any suggestions for stuff to do in Springfield if I get there early? Remember, please signal boost if you’re enjoying these updates! MPG Day 1: 27.6mpg. Terrible, given I’ve been averaging over 30 since I had all the work done. I blame weight (my entire trunk is full with clothes and books) and mountains. We’ll see how this goes now that I’m in flatter areas. Well the road trip officially starts Friday, but I’ll be packing and getting ready all day today and tomorrow. Finally got all the last bits of Nigel squared away, including her stickers and cruise control. 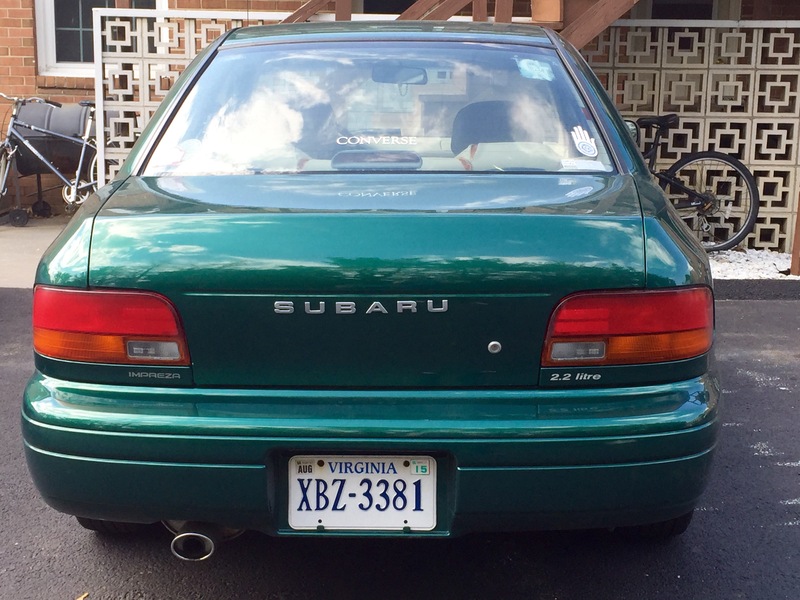 Still need to fix the stickers… “SUBARU” is a bit wibbly and in the wrong spot, and the Impreza sticker is wrong and in the wrong spot. 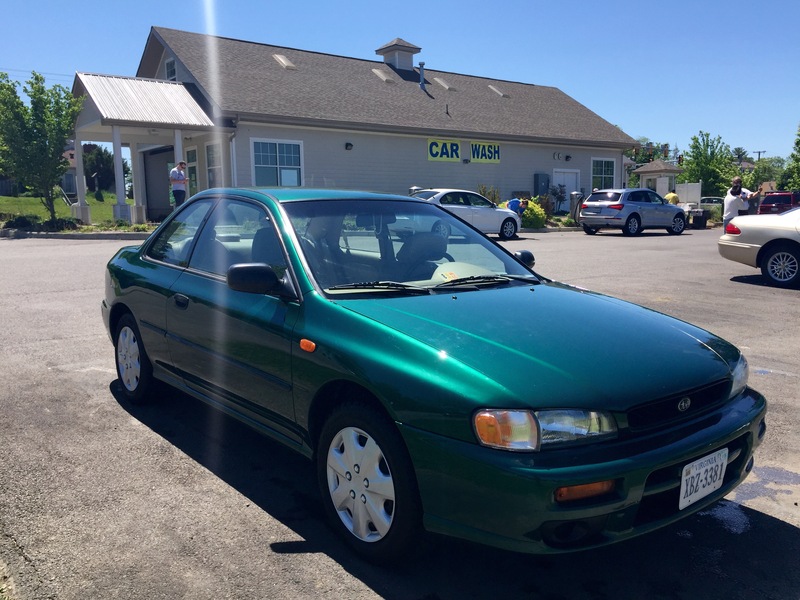 Thanks so much to all the fantastic employees at Shelor Motor Mile Subaru (especially Michael in the Parts and Accessories department) for the new car parts and at Main Auto Spa for all the hard work they put into making my old girl sparkle inside and out. Compare that to the paint on my last post! Now we all know how boring those 2700 miles I’ll be taking can get, even with brand-new scenery, so I’m asking for your help, Constant Readers. I’ve gotten a bunch of new music for the trip, but I could use some suggestions. If you go over to my last.fm profile, you can see my overall top artists plus what I’ve really been jamming to the last six months or so. Anything alt. rock (especially lesser-known stuff) would be right up my alley. So feel free to leave me a comment here (or wherever it gets publicized) with an artist, album, or if you’re feeling really creative, an entire playlist! If you need to email me something, just let me know, and I can shoot you my email address! 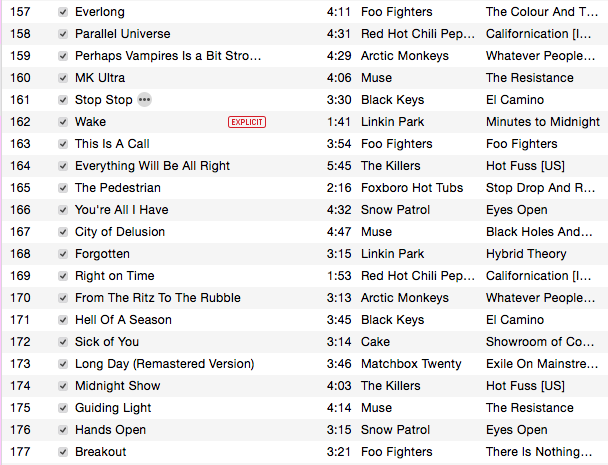 The music you suggest will help me both get to California and through the writing of my dissertation this summer! Finally, if y’all are interested in this trip (or know someone who may be), please feel free to give me a signal boost along the way.